MidStates Oil Refining Co., Inc.
Don’t Waste Oil. We Recycle it. Mid states oil is a fully liscensed, permitted and insured, Waste Oil Recovery Company and will assume responsibility for the safe removal, and disposal of all waste products. 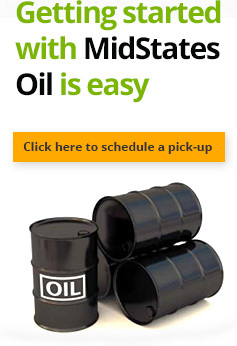 Mid States Oil Refining is Maryland’s only home based full oil recycling and environmental services company. Headquartered in Curtis Bay Mid States Oil is centrally located in the region. We can recover Waste Oil, other petroleum products such as Hydraulic Oil, Kerosene, Heating Oil, Gear Oil and Automatic Transmission Fluid; waste antifreeze as well as provide full vacuum services, recycled antifreeze and an entire range of other services and products all designed to assist the customer with proper environmental compliance and efficient operations of their business. Customer service is an attitude…not a department. Mid States Oil employs a diverse fleet of trucks and vehicles to recover your Waste Oil, Oil Filters, Anti-Freeze and other materials. Please call our dispatch office at 410-354-9500 or 800-331-5408 to schedule your recovery needs. There are times when one or more of our fleet will be dispatched to your location based on your needs. Despite the type of recovery or delivery you will receive a signed manifest in accordance with all State and Federal regulations. Mid States Oil management has over 50 years of oil, customer service and environmental experience. The core ownership of Mid States Oil has been in place for over 20 years adding stability and continuity to our service in an ever changing market place. At all Mid States Oil facilities our products are contained and transported in accordance with all Federal, State and local regulations. We strive to educate our customers in these same practices. At all Mid States Oil facilities our waste products are disposed of and transported in accordance with all Federal, State and local regulations. We strive to educate our customers in these same practices.